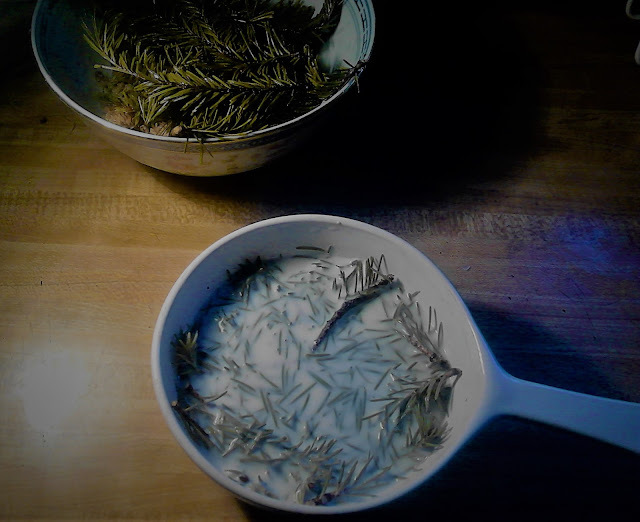 Wild Roots Herbal Learning Centre: Douglas Fir: Sweet and Sensuous...Who Knew! Douglas Fir: Sweet and Sensuous...Who Knew! We're going a little crazy around here these days ~ Conifer crazy that is! I'm always telling my students "You're only limited by your imagination and creativity as to what you can do with plants". I practice what I preach and I have a very curious mind, so I'm always conjuring up new and simple ways to incorporate plants into my daily routine: as food, medicine, cleaning my home, personal grooming and on and on. Keeping it simple means I have more time to play in the forest. So, the other week as I was planning my "All About Conifers" class I came up with the ideas to infuse Douglas Fir in milk as the aromatic compounds are soluble in water (as well as oil, alcohol and honey). The experiment exceeded my expectations. The tastes and energetics are very similar to Cardamon...warming, sensuous with hints of citrus, mystery and the wild forest. It makes a wonderful drink warmed up with a dollop of honey (Fir honey) and like all conifers it is both relaxing and energizing. Milk is a wonderful nourisher for the bronchials and Fir is a great bronchial tonic, anti-microbial. The Fir milk can be used to replace the liquid portion in baking or cooking. I'm working on a Fir pound cake with a Fir syrup glaze. To make the Fir milk: Heat to scalding (small bubbles will form around the edge of the pan) some good quality high fat organic milk. Add fir tips to saturate the milk and infuse for a couple of hours or overnight. The longer it infuses, the stronger the taste. Ah yes...what you can do with a curious mind, a bit of creativity, a healthy dose of imagination and plant friends!